Welcome to the epitome of awkward: preparing for your first ski trip. Take the biggest clown shoes you can possibly imagine wearing and multiply their length by 5. Then, make them weigh about 4lbs each. Top it off with a couple of sharp-ended trekking poles and you have the ensemble pretty well described. Now, walk in them. In your house. Because it's good to get used to stepping on your own heels on solid ground before trying them out in slippery snow. Before we go all out with the skis, however, you should probably get used to wearing the boots. 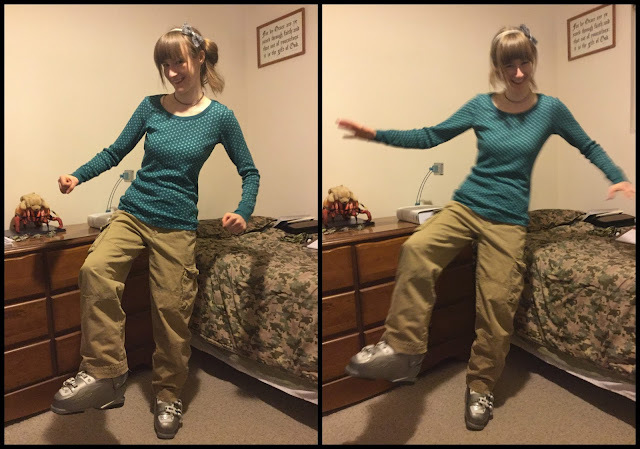 They feel a little bit like roller blades or hockey skates, but with a precarious forward-leaning stance and they weigh about twice as much. Navigate your entire house in them. Wobble on the staircases, cautiously clunk across your hard flooring, and walk with the strangest posture you've experienced over your carpets. Yup, you're doing it right. 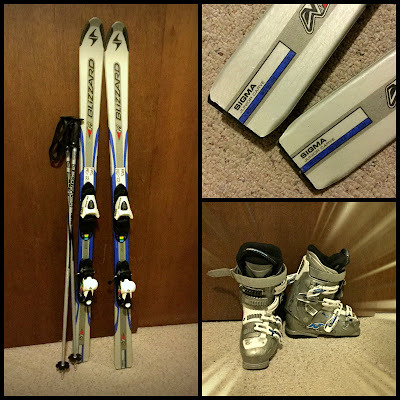 Now, for the fun part- attach your boots to your skis. In all seriousness, this actually is kind of cool. Never in my life have I felt more secure leaning my body so far past my feet! Play around with that. It's fascinating how well you can stay upright (I hope it works this good in the snow). Then... oh... then you might want to move in them. That could be important to get the feel for. Congrats. You have now worn and moved about in skis for the first time in your life- do try to keep yourself in one piece when you hit the slopes in the morning. the size of her own body to her feet.